FOUNDRESS, SISTERS OF THE CONGREGATION OF NOTRE-DAME MARGUERITE BOURGEOYS was born in Troyes, in the province of Champagne (France), on Good Friday, April 17, 1620. She was baptized on the same day in the church of Saint-Jean, a church that was located near her home. Marguerite was the sixth child in a family of twelve. Her parents were Abraham Bourgeoys and Guillemette Gamier, and she was privileged to grow up in a milieu that was middle class and thoroughly Christian. Marguerite was nineteen years of age when she lost her mother. In the following year, 1640, in the course of a procession held on October 7 in honor of Our Lady of the Rosary, she had an unforgettable experience. Her eyes rested on a statue of the Blessed Virgin, and at that moment she felt inspired to withdraw from the world and to consecrate herself to the service of God. She registered, at once, as a member of the extern Congregation of Troyes, an association of young girls devoted to the charitable work of teaching children in the poor districts of the town. While engaged in this apostolate she learned about the foundation of Ville Marie (Montreal) in Canada. The year was 1642, and at that time she sensed a first call to missionary life. This call was rendered concrete in 1652 when she met Monsieur de Maisonneuve, founder and governor of the settlement begun in New France, who was in search of someone who would volunteer her services for the gratuitous instruction of the French and Indian children. Our Lady confirmed the call addressed to her: "Go, I will not forsake you", she said. Thus assured, Marguerite left Troyes in February, 1653, in a spirit of complete detachment. She arrived in Montreal on the following 16th of November, and without delay she set to work to promote the best interests of the colony. She is rightly considered co-foundress of Montreal, with the nurse, Jeanne Mance, and the master designer, Monsieur de Maisonneuve. In order to encourage the colonists in their faith, she arranged for the restoration of the Cross on Mount Royal after it has been destroyed by hostile Indians, and she undertook the construction of a chapel dedicated to Notre-Dame de Bon Secours. Convinced of the importance of the family in the building of this new country, and perceiving the significance of the role to be exercised by women, she devoted herself to the task of preparing those whose vocation it would be to preside in a home. 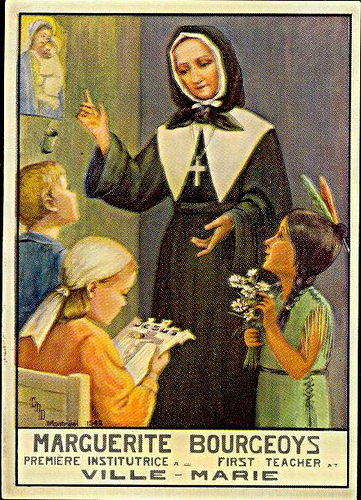 In 1658, in a stable which had been given to her by the governor for her use, she opened the first school in Montreal. She also organized an extern Congregation, patterned after the one which she had known in Troyes but adapted to the actual needs. In this way, she could respond to the needs of the women and young girls on whom much depended as far as the instruction of children was concerned. In 1659, she began receiving girls who were recommended by "les cures" in France, or endowed by the King, to come to establish homes in Montreal, and she became a real mother to them. Thus were initiated a school system and a network of social services which gradually extended through the whole country, and which led people to refer to Marguerite as "Mother of the Colony". 1658, the group of teachers who associated themselves with her in her life of prayer, of heroic poverty, and of untiring devotedness to the service of others, presented the image of a religious institute. The Congregation de Notre-Dame received its civil charter from Louis XIV in 1671, and canonical approbation by decree of the Bishop of Quebec in 1676. The Constitutions of the Community were approved in 1698. The foundation having been assured, Sister Bourgeoys could leave the work to others. She died in Montreal on January 12, 1700, acknowledged for her holiness of life. Her last generous act was to offer herself as a sacrifice of prayer for the return to health of a young Sister. Forty members of the Congregation de Notre-Dame were there to continue her work. On November 12, 1950 Pope Pius XII beatified Marguerite Bourgeoys. Canonizing her on October 31, 1982, Pope John Paul II gave the Canadian Church its first woman saint.